Your off-road adventure begins here and below is a guide to bookmark, if you are off that ‘road’. 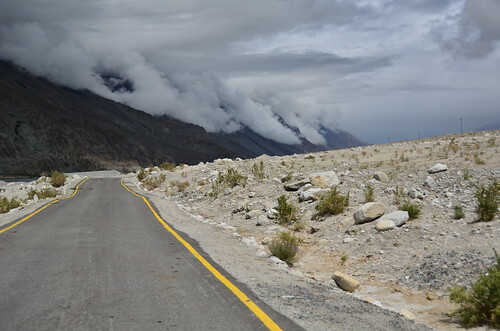 Driving to Nubra valley must be the toughest drive that I have ever experienced; narrow unpaved mountain roads with two-way traffic in a single lane. Adrenaline packed drive and to an increased excitement, it was also snowing. 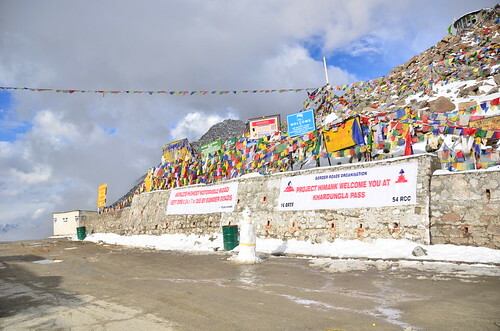 Pictured here is the Khardungla Pass, the highest motorable road in the world at 18380ft, I can call it my little personal ‘travel’ achievement. 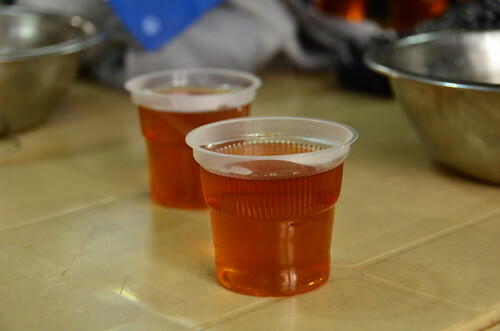 Stopped at a cafe that served the infamous 2-minute Maggi Noodles and hot tea. 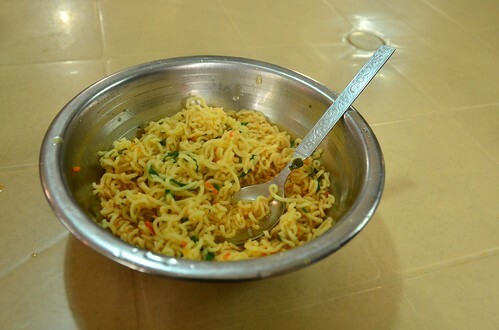 Maggi is the perfect dish for the cold and you get a hygienic meal in the middle of nowhere. 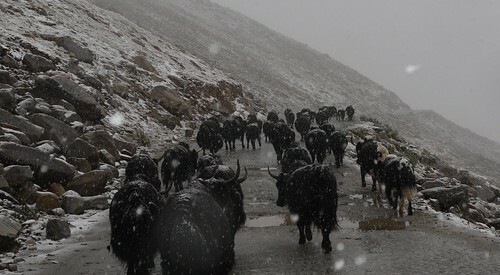 A little stretch where we shared the road with the yaks. 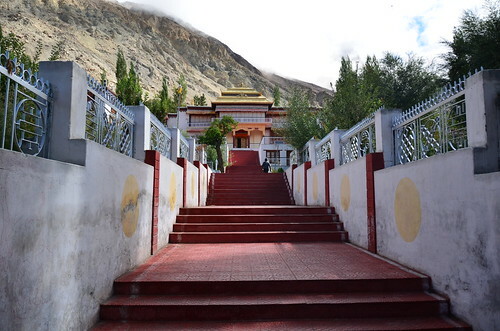 With unique bamboo-stilted walls and thatched roofs, we called the Silk Route Cottages at Nubra Valley our home for the night, to explore the valley, and the villages. Silk Route cottages is a haven for the naturists. 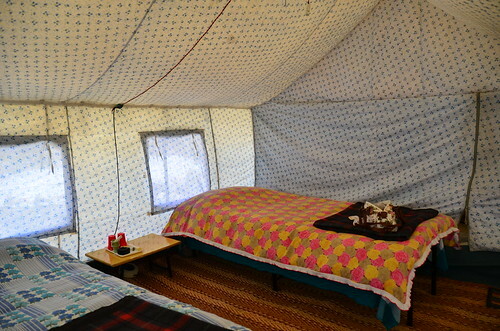 Its bang in the middle of the soaring mountains on either sides, tall trees, a vegetable and a fruit garden. The cottages takes you back to the time when you weren’t very used to all the conveniences that you take for granted now. The electricity shuts at 11pm and the hot water runs only for a few hours in a day. But that didn’t stop us from playing boardgames in candle light. 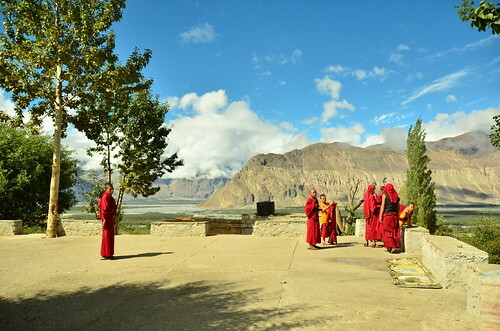 We picked apricots in the garden and packed a snack for the early morning trip to the Sumur monastery. 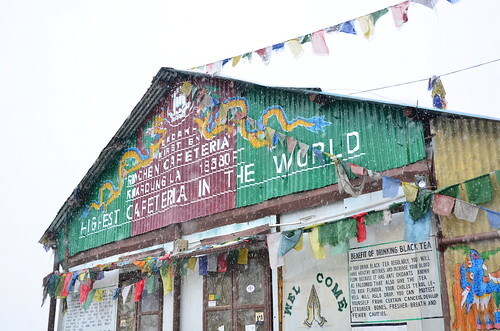 With interesting insights to the Buddhist way of life, from ancient Buddhist relics to brightly colored prayer flags, grainy hand-sanded walls to crimson and gold artifacts, it was more a treat than a temple. 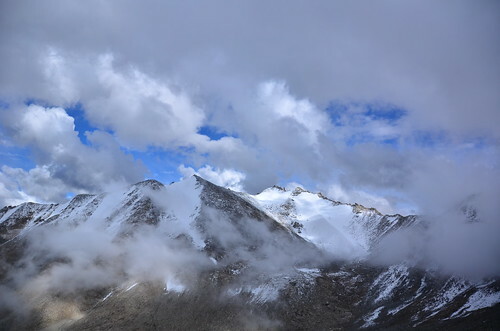 If you love white water rafting, one of the best experiences is down the Shyok/Siachen river, and if you’d like to test your mettle at the survivor series, what better place than a mountaineering expedition by the Siachen glaciers. If you thought that deserts and camels were only for the eastern states of India, this might make you think again. 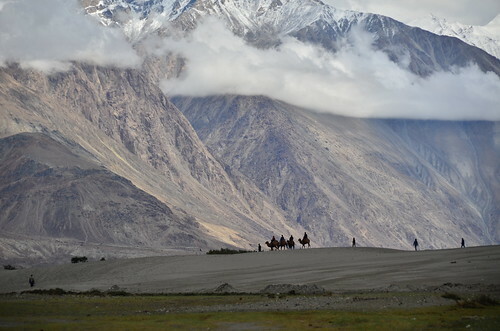 For those in need of an experience that’s not as dare-devilish, there’s enough and more that can be done in the remote villages of Nubra Valley. 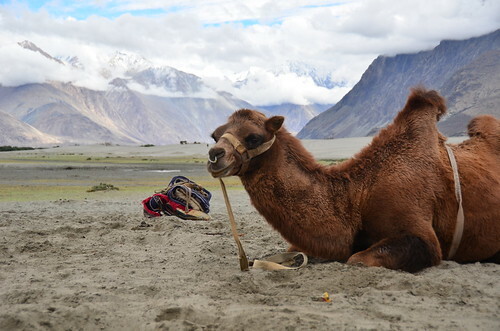 If you visit this area between July and September, you will have a memorable experience at the Bactrian Camel Safari. 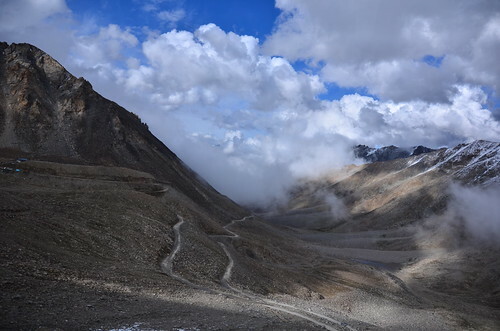 It’s a wobbly joy ride as you explore the rugged mountain areas through some of the oldest passes within the country. Try a bath at Panamik Hot Springs, where they provide hot shower rooms that channel the stream directly. 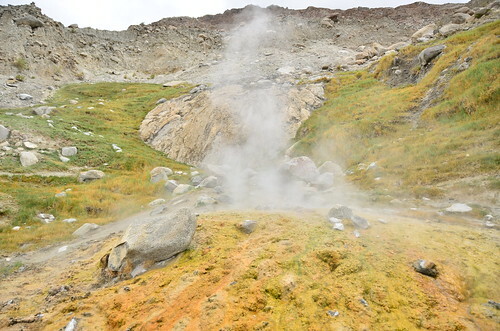 The hot springs are rich in sulphur and it helps in curing rheumatism. Panamik is the last village accessible in India. 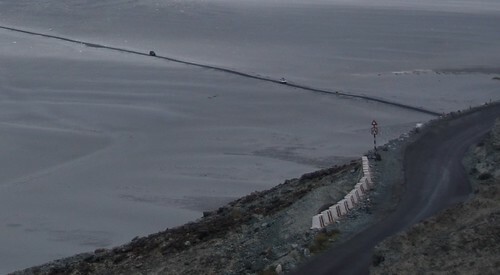 Just few kilometers from here starts Siachen Glacier, the highest battlefield in the world where Indian and Pakistani troops have been fighting for years. But in this area there are almost no sign of conflict. 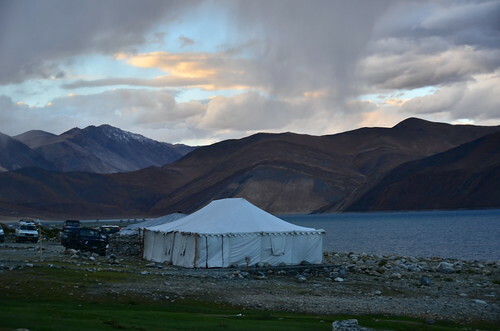 A new day in Leh, we start our morning trip to Pangong lake, a 4-5 hr drive for a 120km distance. We chose to camp out by the lake in make-shift pinned-down house tents for the night at Camp Watermark. 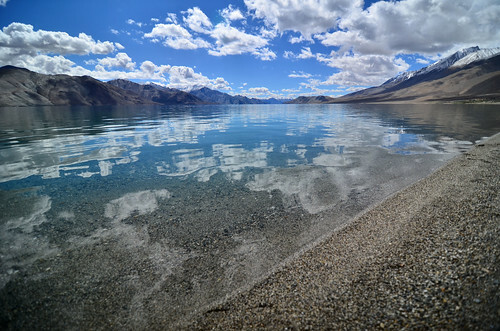 I donno if its the elevation but the clouds always felt as if it were at an arm’s distance..
A salt water lake that extends beyond the borders to Tibet and freezes in winter despite being saline water. 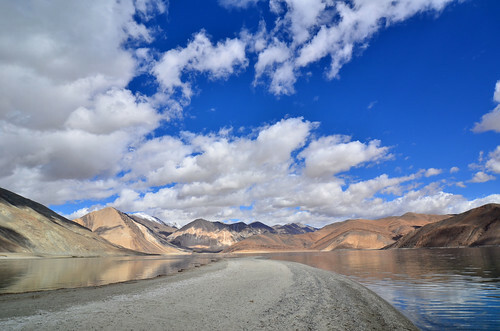 If you are a Bollywoodian, you might have seen the lake along with Manisha Koirala’s curves in the famous Satrangi Re song, Dil Se or ogled at Kareena in the last scene of the movie 3 Idiots. Regardless, the Tinseltown has made the lake popular and this beautiful natural location has attracted more tourists from all over the world. 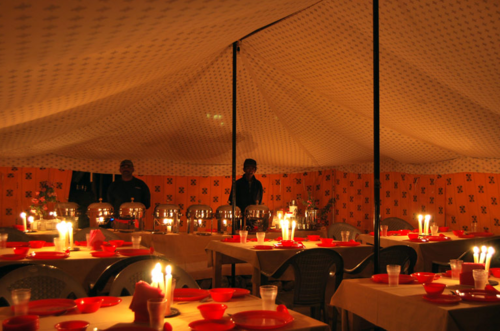 The dining tent at the camps, serving a vegetarian buffet that’s included in the tent tariff. 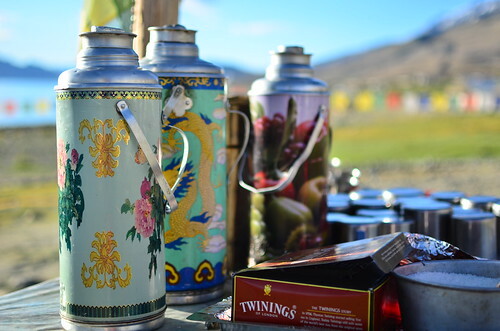 Hot tea and coffee in thermos that’s served all day. From fertile, lush green, apricot laden orchards on one side to frozen sands and white-mountain peaks on the other, this experience can be quite a mixed bag of interesting surprises – and a visual treat at that! 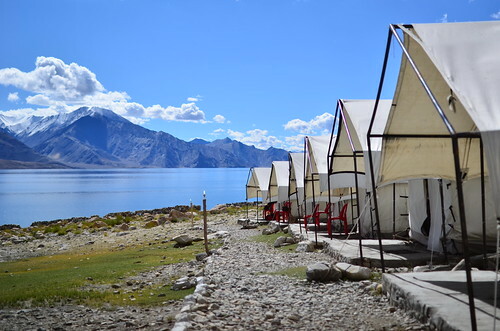 There are only very few places on earth that can take you beyond what a vacation can offer and its no surprise that Ladakh is a life-changing experience for many!